Along with Lyft and Uber, Pinterest is the latest startup "unicorn" expected to go public over the next few weeks. And while the company has potential, we recommend not investing in the Pinterest IPO. This company has so many red flags, it's hard to keep them all straight. In fact, we've already counted eight, before Pinterest even goes public. In February, the company confidentially filed for an IPO with Allen & Company, JPMorgan & Co. (NYSE: JPM), and Goldman Sachs Group Inc. (NYSE: GS). The plan is to list its shares under the symbol "PINS" on the New York Stock Exchange. Pinterest's website provides visual recommendations to "pinners" based on interests and tastes. These are called "pins." So, when a "pinner" saves an image (pin), it's then organized and placed into their collections (board). Think of it like an online scrapbook mixed with social media. But instead of statuses and character limits, it's more about users sharing and saving images around things like interior decor, cooking, recipes, art, and fashion. And it's impossible to overlook the popularity of social media. People love having their own profiles, sharing interests, and even photos. For many, it's a way to express their identities online. However, companies like Facebook Inc. (NASDAQ: FB) remain at the top of the industry (2.3 billion users). And Pinterest is in direct competition with this juggernaut (265 million users). Luckily for Pinterest, it hasn't dealt with any privacy scandals like Facebook did in 2018. But much like Snap Inc. (NYSE: SNAP), Pinterest is in Facebook's crosshairs. And Facebook is known for pulling out all of the stops – even copying the competition. Unfortunately, Lyft's $911 million and Uber's $842 million in losses in 2018 also have analysts skeptical toward the flock of heavy-hitting tech IPOs in 2019. Still, Pinterest has some analysts in Wall Street hopeful. 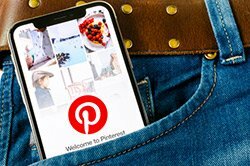 In 2018, Pinterest saw $756 million in revenue (up 60% from 2017's $473 million). That's 40% growth in just one year. Beyond that, Pinterest has grown in its active user count 22% since 2016. But again, the social media industry is packed with competition. There's also Twitter, Instagram, Google, Houzz (online home improvement), Allrecipes (online recipes), and Tastemade (online cooking content) following closely behind. As of right now, Pinterest's IPO price range has not been made public. And its goal for shares sold has also not been revealed. Its current private valuation is estimated at around $12 billion based on total funding of $1.5 billion. And its filing showed the biggest shareholders include FirstMark Capital, Bessemer Venture Partners, Fidelity Investments, Andreessen Horowitz, and Valiant Capital Management. Pinterest's user popularity, easy-to-use website, and revenue growth have all created solid hype around the IPO. Uber or Lyft IPO is a very very risky investment. Please do your homework. They have been in the red for how many years. Again be very careful, you have been warned.